Below is another instance of notification -- in fact, the TWENTY-SEVENTH KNOWN VICTIM . . . and there are obviously MANY more. Thank you for the correspondence, and the more info that can be provided, the better. Perhaps point out to "Tom" that FEAR stifles the truth, which is the ONLY path out of this dysfunctional mess, and is only False Evidence Appearing Real. Stay strong my friend. Update: As I had washed my hands of this a few months back, and nearly forgotten it, I received a call from a very terrified person. He wouldn't give me his name or phone number, and the ones he gave me I'm very sure are falsified. He claims to have discovered the person/s involved in this, and has been since under attack in every technological aspect of him or his entire family's life... and in one scarier, more surreal instance an actual multi car hit and run, an attempt to force him off the road. He says all his complaints, queries, etc. are getting brushed under the proverbial rug. He asked me too look into some things, to verify some results. Mainly because he claimed to not have the technological wherewithal to be sure it was accurate, but also because what he was claiming surely can't be possible. 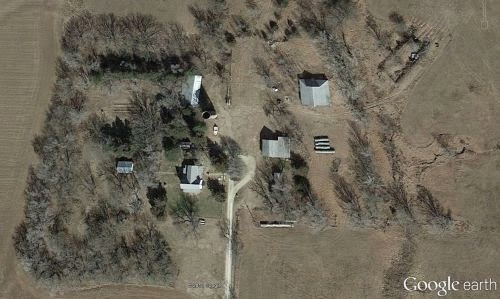 He told me there were many major corporation sub nets/IPs/entire network trunk lines being re-directed through this farmhouse in Potwin Ks. I wanted to just write it off a hullabaloo, but upon tracing a few of the numbers he gave me, I can legitimize his concern. Either this man has a digital bulls-eye painted on his forehead, or is directly involved and attempting a disinformation campaign. Not sure it this is something I'm willing to lose much more sleep over, but I know I need some additional resources/brainpower. I know it sounds virtually impossible, and if it was could only be done with complete government approval. I told him a lot of the hush hush attitude was more likely a gag order, preventing the disruption of ongoing classified projects. Don't ask me what, I'm no Wikkileaks. Just a friendly neighborhood techie trying to sort fact from fiction. I have decided not to blog/write further on this topic, on the slim chance that it is some cataclysmic or life altering scenario, best not to draw any more attention. If you would like more information on this, feel free to ask. I've only spoken to him once at the moment, and had talked him into contact info he could give me to reach him. However, the contact info he gave me was obviously bogus to anyone who knows how to Google a land line phone number. Let me know what you think, eh? Claimed name was "Tom", although he was more than hesitant while giving it, so likely fake. The contact number he had he did not remember, had to look it up (suspicious). Also, this guy claims to be living in Central Ks, when the number he gave me traced to California, under references owners Cynthia/Lucille Fatica. Either this guy is who he says he is and fells as if he is in real danger from this, or this is in fact an associate of the Potwin Hackers attempting a disinformation campaign. Thanks for your message. I'm asking me FBI to investigate the surfeit of irregularities that continue to emanate from this house and will include your feedback. The entirety of my network usage was being re-routed through this place. I can't imagine a farmer with server stacks and T1 lines. Maybe there's more info I haven't found yet? Understand these posts are dated 2011, surprised this is still coming up.